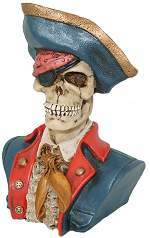 This One Eyed Jack Buccaneer Skull is decked out in all his pilfered finery. This Pirate is perfect for young or old Tampa Bay Bucks fans. Exquisitely hand painted in vibrant colors, solid resin desk paperweight or figurine packed in glossy picture gift box. 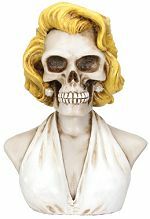 A new Marilyn skull in her fabulous white halter dress. Exquisitely hand painted in vibrant colors, solid resin desk paperweight or figurine packed in glossy picture gift box. 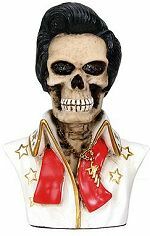 A new Elvis skull in gold embossed white leather. Exquisitely hand painted in vibrant colors, solid resin desk paperweight or figurine packed in glossy picture gift box. 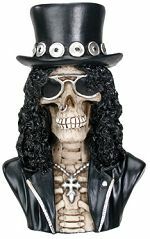 The popular Sklash as skull bust from the perennial classic Rocky Horror Picture Show. Exquisitely hand painted in vibrant colors, solid resin desk paperweight or figurine packed in glossy picture gift box. 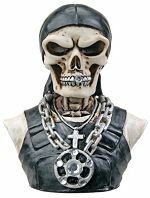 MC Rapper skull with durag skull cap and heavy neck chains. Exquisitely hand painted in vibrant colors, solid resin desk paperweight or figurine packed in glossy picture gift box. 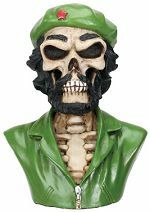 Finally a Che Guevara skull bust in his famous green khakis. Exquisitely hand painted in vibrant colors, solid resin desk paperweight or figurine packed in glossy picture gift box. 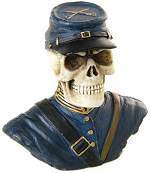 A Union Skull soldier doomed in his new uniform. Exquisitely hand painted in vibrant colors, solid resin desk paperweight or figurine packed in glossy picture gift box. 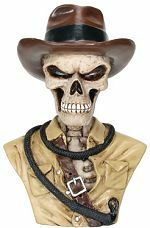 Indy Skull with his indispensable whip and trademark hat. Exquisitely hand painted in vibrant colors, solid resin desk paperweight or figurine packed in glossy picture gift box.